Twelve months ago this weekend the Tipperary hurlers were heading to Belfast for the hugely successful Fr. Alec Reid ‘Festival of Hurling’ but now amidst the changed landscape of fixtures they face up to the earlier prospect of Allianz League activity as they head to Ennis to take on Clare in the opening round of this year’s league. Tipp and Clare are quite familiar with each other in recent times with six of their last ten meetings being contested in the years 2013 to ’17. Of the 55 league fixtures between the sides to date Tipp hold sway with 39 wins under their belt while Clare have 12 and there has been 4 draws. Last year’s encounter before an attendance of 7,254 was the first game since 2009 that a green flag failed to rise as Tipp won by seven with John McGrath (Loughmore-Castleiney) Tipp’s top scorer on 0-10 with 0-5 from frees. Barry Kelly (Westmeath) oversaw affairs in a match which ten players scored for Tipp. and also in 2014 at Limerick – Tipperary 2-24Clare 2-17 (Semi-Final), 2015 back in Ennis – Tipperary 2-19 Clare 0-20, 2016 again in Ennis – Clare 2-13 Tipperary 0-18 (Quarter-Final) and finally in 2017 in Thurles -Tipperary 0-28 Clare 0-21. Best wishes to the Tipperary hurlers and management as all roads lead to Cusack Park in Ennis this Sunday, January 28th as Tipperary open their Allianz League Division 1campaign with a first round clash against Clare at 2pm. The referee on Sunday will be Alan Kelly. Tickets are on sale at GAA.IE, selected SuperValu and Centra stores and usual outlets – adults €15 and U16’s go free. Buy before match day and get 20% off adult tickets. Moving up to the Division 2 of the Allianz Football League following Division 3 success last season, Tipperary deservedly take their place in the second tier of the league as they look to build on last year with Cork providing the first acid test in round 1 this Saturday, January 27th, in Páirc Uí Chaoimh where throw in is at 5pm. No doubt there will be huge interest once again in the Tipperary football fortunes this campaign and with that interest the team need the Tipperary support base to come out in force behind them as they embark on the quest for further progression. Recent meetings in the league between the sides is rare with two fixtures in the ’90s the most recent. In the ’97/’98 national league on October 19th, 1997 in Clonmel, Cork were the victors 4-17 Tipp 3-5 and in the ’92/’93 national league on March 14th, 1993 in Cork, once again the home side prevailed Cork 3-11 Tipp 1-5. The current Tipperary side are well equipped and motivated to turn the tables and what an ideal start to the campaign it would be for an early away victory. We send best wishes to the Tipperary footballers and management as all head south this Saturday as Tipperary open their Allianz League campaign with an opening round clash against Cork. The referee will be Padraig O’Sullivan (Kerry). Tickets are on sale at GAA.IE, selected SuperValu and Centra stores and usual outlets – adults €15 and U16’s €5, buy before match day and get 20% off adult tickets. This is a double header fixture with Cork taking on Kilkenny in the Allianz Hurling League at 7pm. Local parking restrictions will apply so please note in advance and plan accordingly. There will be huge focus next Monday night, January 29th as the draw for the 2018 Tipperary Senior and Intermediate Hurling and Football Championships will be made in the Thurles Sarsfields Centre. Clubs are invited to attend and all the draws will be announced live on ‘Extra Time’ on Tipp FM from 7pm. Best wishes to Fergal Horgan (Knockavilla-Donaskeigh Kickhams) as he takes charge of the Allianz Hurling League fixture between Cork and Kilkenny on Saturday next. Commiserations to Thurles Sarsfields who failed in their quest for Munster honours as they lost 0-10 to 0-5 to Killavullen (Cork) in the Munster Junior B Hurling Championship Final last Sunday. The Munster Junior B Football Semi Final between Cashel King Cormacs and Cromane (Kerry) due to place on Sunday was postponed due to inclement weather and unplayable pitch. It will now hopefully go ahead on Sunday February 4th, at 2pm in Knockaderry, Co. Limerick; the winners will play Ballybrown (Limerick) in the Munster Final. Semple Stadium gets an earlier taste of action than expected as the AIB GAA Football All-Ireland Intermediate Club Championship semi-final goes ahead this Saturday, January 27th at 2pm where An Ghaeltacht (Kerry) take on Moy Tír na nÓg (Tyrone) with extra time necessary if required. 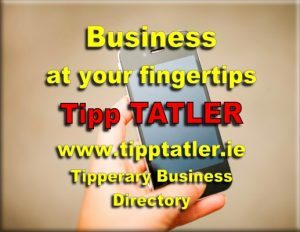 Best wishes to all Tipperary schools in action this week, where the main attention will be on the knock out rounds of various competitions. In the Dr. Harty Cup, reigning champions Our Lady’s Templemore face CBS Midleton in the semi-final this Saturday January 27th in Clonmel at 1:30pm while Árdscoil Rís take on Christian Brothers College, Cork in the other semi-final. Elsewhere, Cashel C.S meet Árdscoil Uí Urmaltaigh Bandon in the Corn Thomais Mhic Choilm (18.5 B H) semi-final at 12:30pm with Glanmire Community College and CBS Mitchelstown contesting the other. This Wednesday, Jan 24th Rockwell College take on Coachford College in the Corn Dhonncha Ui Nuainain (18.5 B F) Quarter Final at 12:30pm and Clonmel High School meet Colaiste Chriost Ri in the Corn an Fhriunnaigh (16.5 AF) Quarter Final at 1:30pm. Moving onto this Friday, Jan 26th at 12:30pm in the Corn Reamainn Ui hOgain (15 B H) KO Round 1 Abbey C.B.S. play Causeway Comprehensive. John Coffey (Boherlahan-Dualla) who celebrated his 100th birthday recently. 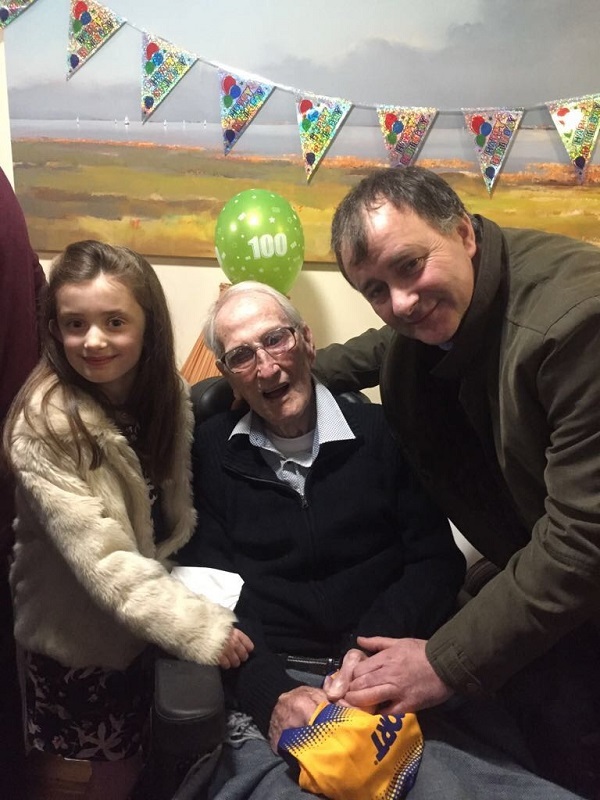 Congratulations to John Coffey (Boherlahan-Dualla) who celebrated his 100th birthday recently. The last surviving member of the 1945 All-Ireland winning Tipperary team, John also won a county championship with his native parish in 1941. As John celebrated this wonderful milestone he shared the occasion with his relations at Elm Green Nursing Home in Blanchardstown. The Tipperary Cumann na mBunscoil County Finals were hosted by Nenagh and Youghalarra Handball Clubs last weekend where there was a starting entry of 14 Schools made up of 67 players. Due to the bad weather and some injuries a number of ‘no shows’ left 27 games to be contested. Ardcroney came out on top with five titles with Ballina, Cashel, Kilruane and Carrick on Suir taking one each. The county Cumann na mBunscoil co-ordinator Paddy Collins presented the winners and runners up with medals and wished all going forward to the Munster finals in Broadford in Limerick on Saturday February 3rd the best of luck and thanked all who helped out at both venues especially the coaches and parents. The winners in the finals were as follows; GU11S Lucy Gould (Ardcroney), BU11S Stefan Tobin (Gaelscoil Carrick On Suir), GU11D Aoife Williams/Clodagh Shinnors (Ardcroney), G11D Aoife Williams/Clodagh Shinnors (Ardcroney), B11D Dean Carey/Eoin Bourke (Ballina), G13S Leanne Gould (Ardcroney), B13S Jack Mulcahy (Ardcroney), G13D Hannah Grace/Christine Percy (Kilruane) and B13D David McGrath/Anthony Walsh (Cashel). The scholarships are confined to 2nd Year, TY and 5th Year Students in 2018 and previous recipients of Tipperary GAA Gaeltacht scholarships cannot apply in 2018. Students wishing to secure a scholarship from Tipperary GAA should complete the application form which has been circulated to all club secretaries and submit it through their own local GAA club. The secretary of the GAA club must sign the form and attach a reference letter supporting the applicant’s application before returning it to the county rúnaí. Please note the club recommending the successful applicant will be contributing €75 to the scholarship along with the Division, Co. Board and Munster Council. Interviews for the scholarships will be held in Lár na Páirce around the end of February to establish each candidate’s suitability. Once this receipt is received by the county rúnaí the scholarship cheque for €300 will be posted out directly to the student’s home. The closing date for the receipt of Gaeltacht Scholarship Applications is Friday week February 2nd. We would like to wish all participants in Scór na bPáistí Ádh mhór as parish and divisional competitions get underway. No doubt you are all ag obair go dian and we will advertise a competition for all our young enthusiasts in the next weeks notes. Go néirí libh agus go néirí le bhur mentors agus na Coistí éagsúla. Beidh seans ag daltaí sa dara agus sa 5ú bliain cur isteach ar scoláireachtaí CLG don Ghaeltacht Mí Feabhra.. Líon isteach na foirmeacha cuí ó Rúnaí an chlub agus bíodh teastas istigh leis an bhfoirm agus é á sheoladh chuig Lár na Páirce. Is é an 6ú lá de Feabhra an data deiridh don na hiarrataisí . Cuirfear na hiarrathóirí faoi agallamh amach anseo. Bí ullamh. Lár na Páirce GAA museum in Thurles is doing a six-month promotion on its Facebook page at present. The promotion is highlighting notable treasures from the museum, memorable All Star hurlers and footballers and recalling famous GAA games. All are well illustrated with relevant material. The management of Lár na Páirce invite you to view the promotion and respond to it. The first round games in this year’s Electric Ireland Fitzgibbon Cup got under way last Thursday, with a Cork derby to get the competition up and running as UCC saw off the challenge of Cork IT 1-19 to 0-12. Michael Breen (Ballina) shooting 0-3 was on the scoresheet for UCC, with the full Tipp contingent of Andrew Coffey (Nenagh Éire Óg), Conor Hammersley, Enda Heffernan, Ronan Heffernan and Michael Ryan (all Clonoulty-Rossmore) lining out for CIT while Fergal Horgan (Knockavilla-Donaskeigh Kickhams) refereed the game. On Sunday last Jason Forde (Silvermines) scored 1-10 (0-5f), John McGrath (Loughmore-Castleiney) 1-1, David Gleeson (Ballinahinch) and Paul Maher (Kilsheelan-Kilcash) 0-1 each as University of Limerick defeated Dublin Institute of Technology 3-29 to 4-17 with Patrick Maher (Lorrha-Dorrha) scoring 2-1 and Justin Cahill (Kilruane MacDonaghs) 0-2 for DIT in a match refereed by Johnny Ryan (Boherlahan-Dualla). In the other match on Sunday, NUIG with Shane Hennessey (Nenagh Éire Óg) in goal and Shane Fletcher (Roscrea) and Conor Ryan (Nenagh Éire Óg) outfield had 15 points to spare over Trinity College 2-22 to 0-13 with Cormac Keating (Portroe) introduced for Trinity late in the second half. DCU 3-15 defeated Limerick IT 2-17 on Monday where Sean Ryan (Sean Treacy’s), Robert Byrnes (Portroe) and Willie Connors (Kiladangan) all lined out for Limerick IT while Darren Moran (Kiladangan) was introduced midway through the first half. Cork IT: Andrew Coffey (Nenagh Éire Óg) and the Clonoulty-Rossmore quartet of Conor Hammersley, Enda Heffernan, Ronan Heffernan and Michael Ryan. DCU: Liam Fahey (Rockwell Rovers) and Steven O’Brien (Ballina). DIT: Justin Cahill (Kilruane MacDonaghs), Bill Maher (Kilsheelan-Kilcash), Patrick Maher (Lorrha-Dorrha) and Cian O’Connell (Golden-Kilfeacle). Garda College: Michael Brislane (Toomevara), Michael John Carroll (Clonakenny), Alex Harte (Kilsheelan-Kilcash), Edward Kennedy (Holycross-Ballycahill), Stephen Murray (Burgess) and Diarmuid Ryan (Éire Óg Annacarty-Donohill). Carlow IT: Tommy Nolan (Drom -Inch) and Mark Russell (Lattin-Cullen). Limerick IT: Robert Byrnes (Portroe), David Egan (Clonoulty-Rossmore), Sean Ryan (Sean Treacys), Willie Ryan (Clonakenny) and the Kiladangan quartet of Willie Connors, Darren Moran, Daniel O’Meara and James Quigley. Mary Immaculate College: Ciaran Barrett (Clonmel Óg), Ronan Bourke (Ballina), Chris McCullagh and Niall Heffernan (both Moycarkey-Borris), Liam Ryan (St. Marys), Darragh Peters (Kilruane MacDonaghs), James Mackey and Philip Hickey (both Nenagh Éire Óg) and Pa Ryan (Newport). NUI Galway: Shane Fletcher (Roscrea), Shane Hennessey and Conor Ryan (both Nenagh Éire Óg). UCC: Michael Breen (Ballina) and Billy McCarthy (Thurles Sarsfields). UCD: Kieran Cummins (Moycarkey-Borris), Rory Purcell (Thurles Sarsfields), Stephen Quirke (Moyle Rovers) and John Joe Ryan (Clonakenny). University of Limerick: Jason Forde (Silvermines), David Gleeson (Ballinahinch), Barry Heffernan (Nenagh Éire Óg), Paul Maher (Kilsheelan-Kilcash), John McGrath (Loughmore-Castleiney) and Gavin Ryan (Upperchurch-Drombane). WIT: Kevin Hassett (Drom-Inch), Tom Hayes (Moycarkey-Borris) and Michael Whelan (Carrick Davins). The following are the 4 groups: Group A: CIT, UCC, UCD; Group B: UL, DIT, WIT; Group C: LIT, DCU, Garda College and Group D: Mary I, IT Carlow, NUIG, Trinity College Dublin. Cork IT: Kevin Fahey (Clonmel Commercials) and Tadhg Fitzgerald (Moyle Rovers). Garda College: Stephen Murray (Portroe). IT Carlow: Mark Russell (Lattin-Cullen). Maynooth University (Emmett Moloney (Drom-Inch). UCC: Jack Kennedy (Clonmel Commercials). UCD: Liam Casey (Cahir), Jimmy Feehan (Killenaule), Charlie Manton (Fethard) and Colm O’Shaughnessy (Ardfinnan). University of Limerick: Luke Boland (Moyle Rovers) and Ted Lowry (Arravale Rovers). Club Officer Training nights have been arranged for 2018 as follows – this Thursday January 25th in the Anner Hotel, Thurles and next Wednesday January 31st in Clonmel Park Hotel. An information night for all Club Children’s Officers and Designated Liaison Persons which was to be held in Thurles Sarsfields Centre (Upstairs) this Tuesday night January 23rd has been postponed as Croke Park are unable to provide a tutor on that night. It has been rescheduled for Wednesday 7th February at 7.00pm. As Garda Vetting is now a legal requirement up to date information will also be given on the night. All clubs are requested to send their Children’s Officer and Designated Liaison Person to this information night. If any Club is unable to send their Children’s Officer or Designated Liaison Person they should send their Senior Club Chairperson to deputize on the night. Please note all applications must be accompanied by a cheque for €100, from the applicant’s home club, which will be refunded after officiating at ten games. Completed application forms accompanied by €100 cheque only should be forwarded to Paul Stapleton, Secretary, Tipperary Referees Administration Committee, Lár na Páirce, Thurles, Co. Tipperary. All clubs who do not currently have a referee in their club are encouraged to trawl their membership for prospective candidates. Further information / clarification can be had from Jim O’Shea chairperson 085 1744791 and Paul Stapleton secretary 085 1983325 Tipperary Referees Administration Committee. Congratulations to all who received Annerville Awards last weekend which included Padraic Maher (Thurles Sarsfields) – Hurling, Brian Fox (Éire Óg Annacarty-Donohill) Gaelic Football, Amy Kennedy (Burgess-Duharra) – Camogie, Aisling McCarthy (Cahir) Ladies Football, James Prentice (Ballina) and Jerome Cahill (Lahorna) Handball, Fergal Horgan (Knockavilla-Donaskeigh Kickhams) – Sean Lyons Sports Executive Award and Donie Nealon (Burgess) – Knocknagow Award. The function was held in the Park Hotel, Clonmel to honour all in recognition of their achievements in sport. The 48th Annual Awards Banquet of the New York GAA Minor Board will be held this Saturday, January 27th at the Villa Barone, 737 Throggs Neck Expressway Bronx, NY 10465. Cocktail hour is from 7pm to 8pm with dinner and dancing from 8pm to 12am. Music is provided by the Cunningham Brothers. Admission is $100 for adults and $40 for children under-18. This year, the Guests of Honour are Vincent McCabe (New Haven GAA) & John Lyons and Brendan Maher (Proprietors of Mc Keon’s Bar and Restaurant). The New York Minor Board is proud to recognise their 2017 New York Under-14 All-Star Team in both Football and Hurling that participated in the Féile competitions this past summer in Ireland. They will also recognise their Championship, League, and CYC winners along with the Tournament Captains, 2017 Players of the Year in each age group, our 2017 MVPs (Football and Hurling), as well as the winners of the Scór na nÓg this past year. The John Clarke and John Brady Scholarships will also be presented. Additionally, there will be Minor Board scholarships presented to three high school and three college students who are active Minor Board players. · Paid up Tipperary Supporters Club members will be eligible to vote for the new official 2018 Tipperary Senior Hurler of the Year award at the end of 2018 season. · A draw for five sets of stand tickets for all Tipperary games in the Munster and All Ireland Senior Hurling Championship. · In the event of Tipperary Senior Hurlers reaching the All-Ireland Final, there will be a special draw for 2 night’s accommodation for 2 people in the Four Star Louis Fitzgerald Hotel (match tickets included). Please note: Regular members who have already signed up for direct debit or online auto-renewal will have already been contacted in recent weeks. Direct Debit – This is our preferred payment method. We are encouraging members to switch to Direct Debit payment by offering a €10 discount on the regular 2018 price to any member who pays via direct debit for the first time in 2018. It’s easy to sign up for Direct Debit, just download the form by clicking here, fill it out and send it to Jim Reidy at the address below. When it comes to renewal time, we will mail you well in advance so you can opt in or out for subsequent years. · Tipperary GAA Shop, Lár na Páirce, Slievenamon Road, Thurles. · O’Donoghue’s, Main St, Cashel. · Carroll’s, Castle St, Roscrea. · Elvery’s Store. O’Connell St, Clonmel. · Elvery’s Store. Pearse St, Nenagh. 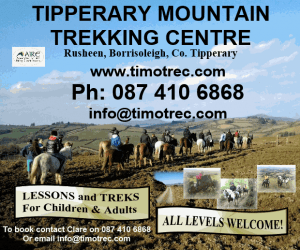 All proceeds from membership go directly towards the preparation and training of the Tipperary Senior Hurling Team.